“The verification of the fact of telepathy, indicating obscurely a kind of dislocation between mind and body, was undoubtedly impressive, so that it began to seem probable, especially under (Frederic) Myers’s tuition, that the two –mind and body – were not inseparably connected, as I had been led by my previous studies under Clifford, Tyndall, and Huxley to believe they were. I began to feel that there was a possibility of the survival of personality." Research carefully. Go to the library. See that telepathy has been shown, repeatedly and reliably, to occur. As you research, design and conduct your own experiments. DOCUMENT as we did. Alejo: "It is weird really to get these images in your head." Cathy: "Yes, it is. I see some women and girls wearing old fashioned bonnets." Alejo: "Yes, Me too. Where are they?" Cathy: "In some old town in the U.S. There are wooden sidewalks. There is a dog." Alejo: "What kind of a dog?" Cathy: "An old yellow dog." Cathy: "Don’t forget to try to send the symbol so Aaron can get it to me." Cathy: "It's not a toe nail clipper?" Alejo: "WHY DID YOU SAY THAT?" Cathy: "I don’t know. It just came to mind." Alejo: "I was RIGHT NOW imaging putting a toenail clipper in my bag to not forget it." BAT: On Aaron's birthday, his aunt Christy, his cousins Kally, and Sarah and I experimented with telepathy. Each wrote an animal on a piece of paper. We sat on the floor holding hands, arranging ourselves in a circle, legs in, so that our feet were touching. The “sender” thought about/imagined her animal and the receivers had seven minutes to try to "get it." When the timer buzzed, we counted together…one, two, three – then all three receivers said aloud simultaneously, the animal that had come to mind. We had no luck until Sarah was the sender and Christy, Kally, and I were the receivers. Timer rings. 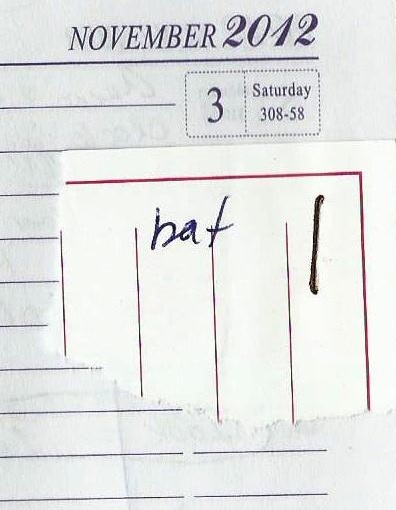 One, two, three – we said simultaneously – “BIRD”...Sarah’s animal was a bat.